E does a lot of competitions and she is always winning something so it is no surprise to me when she occasionally asks out-of-the-ordinary questions. At the dinner table a few days ago she asked such a question but this time it had nothing to do with her competitions, it was something to do with a television program which was to start thirty minutes later. The program itself was one of those reality shows where people, usually a couple, are escorted to and shown around three houses with the prospect of perhaps buying one if it meets with their requirements. The question E put to me was this, ‘Which county in the UK is bordered by seven others’? I didn’t know the answer but took a guess at one which is in the Midlands, an obvious choice but nevertheless I got the answer wrong. I was now curious to know what the answer might be so i went to look for the map book I know we have somewhere in the bookshelves. Sadly I couldn’t quickly locate it so I picked up my tablet pc and browsed on-line for a map of England which showed all the counties and there was the answer, Warwickshire. 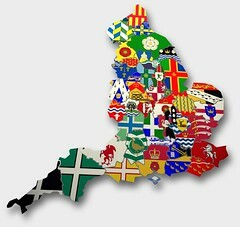 It is evidently the only county in England which is bordered by seven others. This was where the television program was recorded for this particular episode. Afterwards I thought to myself how easy it is to get information about anything these days. My poor efforts in trying to locate a map book, though I know we possess one, were greatly surpassed by the speed of searching via The Internet. Books are becoming more and more obsolete as time passes, much to my horror I might add for I love sitting with a book and losing myself in its pages. I seldom do that now. I suppose there will always be books for reference purposes because storage of information electronically can be unreliable. I do hope that there will always be a place for books.